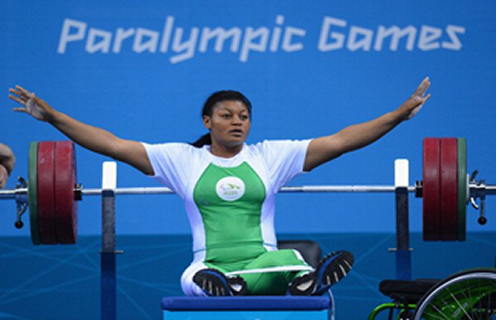 Josephine Orji yesterday shattered the World Record with a lift of 160kg to win the gold medal in the Women's 84kg Power-lifting event of the Rio 2016 Paralympics. The latest gold medal brings to 8th of Nigeria's haul. Earlier on Tuesday, Flora Ugwunwa set a new world record in the women's javelin - F54 event to give Nigeria her seventh gold medal. She recorded a throw of 20.25 metres after six attempts to win the gold medal and take Nigeria's tally to seven gold, two silver and one bronze medals. On a day when Nigeria's medals search was looking to be futile after some failure in the favourite hunting ground of power-lifting, the athletics event provided succour. Ugwunwa beat a field of nine to set new Paralympic and world records, while Tunisia's Hania Aidi won the silver medal with a throw of 18.88m. South Africa's Ntombizanele Situ completed the African sweep of the event's medals by winning the bronze medal with a heave of 17.90m.